An Gaeltacht Mhúscrai / The Muskerry Gaeltacht isone of the few parts of Ireland where the autochthonous Gaelic language and many of the cutural traditions of yore have been kept alive.This remarkable achievement may well be due at least in part to the isolated hilly landscape of this area, straddling the rocky slopes of the Derrynasaggart and Sheehy Mountainsto take in numerous bogs, heaths, forests, rivers and streams. 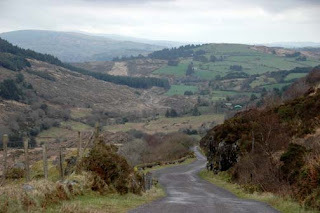 The valleys and lowlands contain rich farmland and meadows, criss-crossed with intricate hedgerows and interspersed with unpolluted lakes.Ken Loach‘s 2005 film The Wind That Shakes the Barley, about the Irish War of Independence and subsequent Civil War, shot locally, was based on events in this part of County Cork, which saw some of the worst atrocities of the era. Many were committed by the infamous Black & Tans and the Auxiliaries. The British Army attitude was summed up by Major Bernard Montgomery, later Field Marshal Lord Montgomery of Alamein, who wrote: “My whole attention was given to defeating the rebels. It never bothered me a bit how many houses were burnt.” The IRA commander Tom Barry wrote: “British terror was met by not less effective IRA counter terror. We were now hard, cold and ruthless as our enemy had been since hostilities began.”The countryside is still dotted with the shells of destroyed farm buildings, and “The Troubles” remain a sensitive topic. Carrigaphooca (“The Rock of the Sprite”), a historic Tower House perched on a high rocky outcrop overlooking the Sullane River, commands truly panoramic views of the surrounding landscape. Built c.1450 by Dermot Mór MacCarthy, it is a very simple building with a single room on each of its five levels. The MacCarthys of Carrigaphooca were constantly engaged in local and internecine warfare. Sir Cormac MacDermot MacCarthy, Lord of Muskerry, sided with the Crown in 1602 and his stronghold was consequently attacked by Donal Cam O’Sullivan Beare. After a difficult siege the huge wooden door of the castle burned down. The garrison was set free and O’Sullivan Beare retrieved a chest of Spanish gold he had presented to the MacCarthys some months earlier in return for their support against the English. Sir Cormac, held by a distrusful Sir George Carew in Shandon Tower, soon joined forces with him, having escaped from captivity by lowering himself from a high window using knotted sheets – a remarkable feat for a 72-year-old. Together they moved into Macroom Castle, but upon receipt of news of Eoin Roe O’Donell‘s death in Spain, gave up all further resistance to the English. The castle was subsequently owned by the MacCarthys of Drishane until forfeited in 1690. Cill na Martra / Kilnamartyra / Kilnamartery (“The church of the Human Relic”) is a small village on the site of a monastery founded in the C6th by Saint Lachtan; rebuilt after a Viking attack in 830 AD, the church survived as a place of pilgrimage until Cromwellian times. The human relic in question is the saint’s hand preserved in a C12th shrine, now in the National Museum in Dublin. The Prince August Toy Soldier Factory, founded in 1976 by hobby enthusiast Jan Edman from Sweden, manufactures toy soldier figurines, casting moulds, hand-painted chess sets, and Lord of the Rings figures. The entertaining and informative Visitors’ Centre encourages factory tours. Tig Ui Murchú and Mons Bar / Halfway House are friendly local pubs that host frequent traditional music sessions. Findus Guest House at Ballyvoige has been making visitors comfortable with its award-winning B&B facilities for over 25 years. It is owned by Mary and Michael O’Sullivan, anything but cold fish. Baile Bhuirne / Ballyvourney and Baile Mhic Íre / Ballymakeera villages in the Derrynasaggart Mountains share a beautiful setting among forest and valley landscapes. Between the two villages is a little bridge leading to the popular Holy Well and burial mound of Saint Gobnait, whose feast day is celebrated on 11th February. Ionad Cultúrtha, a cultural centre for traditional and contemporary art, is a venue for many interesting concerts and exhibitions. An Muileann / The Mills Inn, founded in 1755, is a family run hotel with an award-winning restaurant, Piséog’s; the bar is a popular traditional music venue. The exceptionally scenic mountain route from Ballyvourney to Ballingeary is a single lane track, not recommended for nervous drivers, as meeting an oncoming car can result in having to reverse for several hundred metres. Cúil Aodha / Coolea, a village close to the source of the River Sullane high in the Derrynasaggart Mountains, one of the areas most scenic gems, is justly renowned for the strength of its cultural traditions, especially that of Sean-Nós (“Old Style”) unaccompanied solo singing. The composer Seán Ó Riada lived in the area until his death, and his son currently conducts the highly regarded local choir, Cór Chúl Aodha. Coolea is linked to Morley’s Bridge and Kilgarvan (Co. Kerry) on ByRoute 5 via the Inchee Bridge over the Roughty River. A pub on this route, The Top of the Coom, claims to be the highest in Ireland. Inse Geimhleach / Inchigeelagh / Inchigeela and its twin, Beal Atha ‘n ghaorthaigh / Ballingeary are located in the Sheehy Mountains at the head of an exceptionally scenic part of the River Lee Valley known as the Cork Lake District. 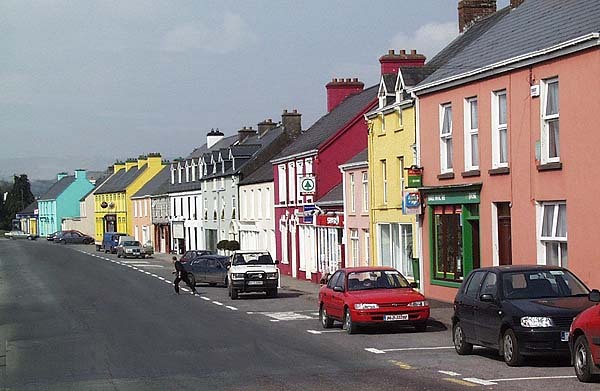 Together with several tiny hamlets, the villages constitute the old parish once known as Iveleary (Uibh Laoighaire – “The O’Leary Homeland”). There are several Ring Forts and archaeological sites of interest in the area. Inchigeelagh’s old church was first mentioned in Vatican records dated 1492, but was probably in existence for many years before. The Reformation had little initial impact on this remote area, and the Roman Catholic Mass is believed to have been celebrated in the church until about 1700. Restored several times, the church was rebuilt in 1814, and finally allowed to decay after the 1885 departure of the last resident Church oI Ireland minister, the Rev. Patrick O’Rourke. The cemetery has always been used by parishioners of all religious persuasions. To many it symbolises a united and peaceful community. Most of the resident landlord families, including the Barters and Graingers, were interred in above-ground vaults at the South-East end. There are also two Roman Catholic vaults in the same area, for members of the O’Leary Breac family. There is a memorial here to famous local poet and song composer Máire Bhuí Ní Laoghaire (1774 – 1849), which probably marks her grave. The Glebe House opposite the cemetery was used at various times during the War of Independence by both Crown forces and the IRA, and was burned by Republican Irregulars in 1921. The church of St Finbarr and All the Angels (RC), an elegant edifice featuring splendid stained glass windows, was constructed in 1847, partly in order to provide relief work at the height of the Great Famine. Between 1845 and 1850 the parish lost a quarter of its population despite the best efforts of the local relief committee, headed by the local clergymen, Fr Holland and Rev Sadlier, and absentee Lord Riversdale‘s agent Denis O’Leary of Coolmountain House, whose soup boiler now stands beside Ballingeary Bridge as the Famine Pot memorial. Michael O’Leary (1888 – 1961) was a locally born WWI British Army hero, fèted by thousand in London’s Hyde Park when he was awarded the Victoria Cross for valour by King George V for an act of almost suicidal bravery in 1915. George Bernard Shaw‘s play O’Flaherty VC was based on him. 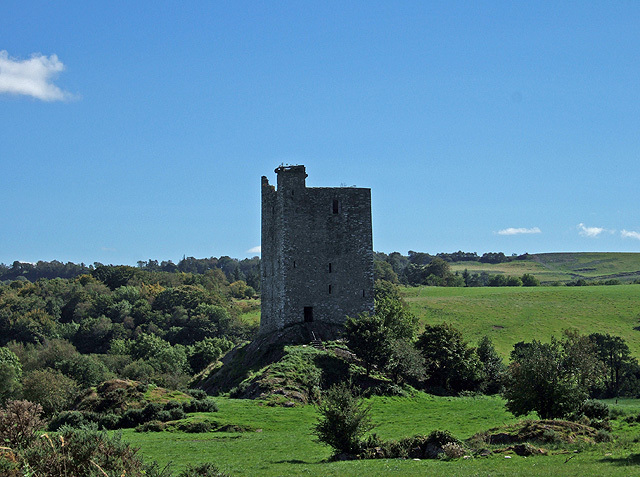 Carrignacurra Castle was built by the O’Leary clan c.1500 on the site of a former Ring Fort. In 1602 it was held by Tadhg Meirgeach O’Leary, whose liege lord was Sir Cormac MacDermot MacCarthy, at that time an ally of the English; when the castle was besieged by Donal Cam O’Sullivan Beare, the garrison quickly changed sides, an example followed shortly afterwards by Sir Cormac himself. After centuries of decay, it was recently acquired and partially restored by Maxim Gormanov. The nearby footbridge across the River Lee can be rather too exciting for comfort at certain times of year. Creedon’s Hotel, Restaurant & Bar (modern) and and O’Sullivan’s Lake House B&B (founded c.1820) are highly recommended family-run establishments in Inchigeelagh village, while nearby Tir na Spideoga (“Land of the Robins”), a renovated 200-year-old farmhouse owned by Greg and Sigi Latour, has self-catering apartments. twee holiday cottages, B&B, Hostel and camping facilities, particularly suitable for anglers. Locha Lua / Lough Allua, a six-mile chain of lakes, is popular with pike fishermen, and is also famous for its white lilies. Oileán Ui Meihighéan is an ancient crannog artificial island / lake dwelling, now used by swans as a nesting site. The South Lake Road is the most scenic route from Ballingeary to Inchigeela. The natural spring beside the road by the entrance to Herlihey’s Farm supplies delicious ice-cold water even on warm summer days. A little further on is a Mass Rock, used as an altar during the Penal Laws era. Teampaillín Eachrois, a ruined church two miles from Ballingeary, was the site of an encampment by Donal Cam O’Sullivan Beare and his 1000 followers on their 1602 forced winter Retreat to Leitrim, which only 35 survived. Colaiste Na Mhumhan, the oldest Irish language College in the country, was established in Ballingeary in 1904. Every summer it welcomes about 400 teenagers. Films set partly in this district include Aisling Walsh‘s 2004 A Song for a Raggy Boy, released in Spain as Los Niños de San Judas, involving a local Spanish Civil War veteran. The Ballingeary & Inchigeela Historical Society / Cumann Staire Bhéal Átha’n Ghaorthaidh publishes an interesting online-accessible Journal.